QUEEN CREEK, Ariz. -- A Queen Creek homebuyer said an unexpected hike in a homeowners' association fees may force him to walk away from the house he has tried to buy for 10 months. “I'm almost better off looking for another home out of this neighborhood,” said George Peck. On April 28, the HOA told Peck the original fee to transfer into the Montelena community’s homeowner’s association would be $500. On Monday, he received noticed the fee would be $2,500. "I have never seen anything like this,” said Cari Gililland, Peck’s realtor. "I mean, to raise to the fee is one thing,” she said, "but this is five times what the fee was." Peck is now reconsidering purchasing the five-bedroom short sale on Poco Calle. "I'm just disappointed that things have turned out the way they have,” said Peck. 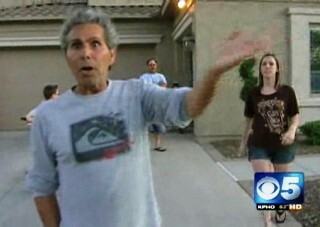 CBS 5 News attempted to contact the president of Montelena homeowner’s association, Anthony Del Corsano. When our crew attempted to knock on his door, neighbors blocked our path and asked us to leave the property. After three attempts, our crew reached Del Corsano on the telephone. He said he had no comment.